I haven’t played Maia since it first made planetfall and landed on Early Access, but that skeletal frame – which now has a lot more meat hanging off it – was shaping into something I think I’ll rather like quite a lot. 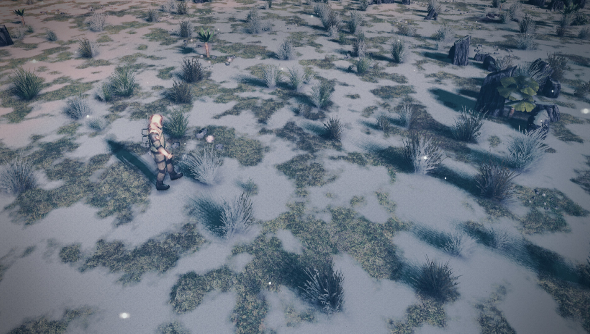 It’s a colony builder and management sim set on an alien world. And it has space chickens and space cats. The game just received a hefty update today along with a 22 percent discount, which you can take advantage of for the next 40-odd hours. The 0.44 update brings with it dangerous things, like massive earthquakes, chain reactions that take out poorly built colonies and cave ins. It all sounds quite traumatic. But it’s not all bad, as colonists can now get medical treatment if a rock smacks them on the noggin. Joining the domesticated space animals is a wild kind: creepy herbivorous underground dwellers. They’ll probably get a more scientific name, or maybe even something in Latin, down the line. These wee beasties can cause some problems by destroying solar panels, which strikes me as rather rude. It is their planet, though. Research has been fiddled with, the save system has been improved, AI isn’t as doolally and there’s been some engine performance upgrades, too. Slap your eyes on this dev walkthrough to see some of these new-fangled features at work.